Furthermore, one can distinguish natural insecticides, such as nicotine, pyrethrum and neem extracts, made by plants as defenses against insects, inorganic insecticides, which are metals, versus organic insecticides, which are organic chemical compounds mostly working by contact. environmentally friendly than synthetic pesticides. The toxin from B. thuringiensis (Bt toxin) has been incorporated directly into plants through the use of genetic engineering. Other biological insecticides include products based on entomopathogenic fungi (e.g., Beauveria bassiana, Metarhizium anisopliae), nematodes (e.g., Steinernema feltiae) and viruses (e.g., Cydia pomonella granulovirus). cisterns to combat malaria. Most of its uses are to combat insects where the adult is the pest, including mosquitoes, several fly species, and fleas. Two very similar products, hydroprene and kinoprene, are used for controlling species such as cockroaches and white flies. Methoprene was registered with the EPA in 1975. Virtually no reports of resistance have been filed. A more recent type of IGR is the ecdysone agonist tebufenozide (MIMIC), which is used in forestry and other applications for control of caterpillars, which are far more sensitive to its hormonal effects than other insect orders. 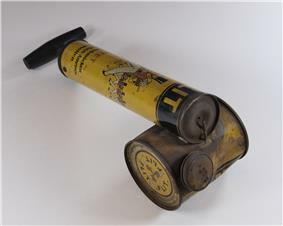 DDT was brought to public attention by aldrin, chlordane, DDT, dieldrin, endrin, heptachlor, mirex and toxaphene. ^ IUPAC (2006). 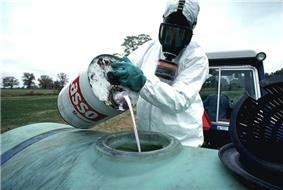 "GLOSSARY OF TERMS RELATING TO PESTICIDES" (PDF). ^ van Emden, H.F.; Peakall, David B. (30 June 1996). Beyond Silent Spring. Springer. ^ "dropdata.org". dropdata.org. Retrieved 2011-01-05. ^ Class, Thomas J.; Kintrup, J. (1991). 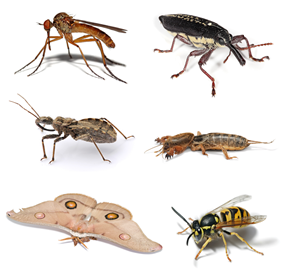 "Pyrethroids as household insecticides: analysis, indoor exposure and persistence". Fresenius' Journal of Analytical Chemistry 340 (340): 446. ^ Yao, Cheng; Shi, Zhao-Peng; Jiang, Li-Ben; Ge, Lin-Quan; Wu, Jin-Cai; Jahn, Gary C. (20 January 2012). "Possible connection between imidacloprid-induced changes in rice gene transcription profiles and susceptibility to the brown plant hopper Nilaparvata lugens Stål (Hemiptera: Delphacidae)". Pesticide Biochemistry and Physiology, 102 (3): 213–219. ^ "Pesticide Fact Sheet- chlorantraniliprole" (PDF). http://www.epa.gov/opprd001/factsheets/chloran.pdf. Retrieved 2011-09-14. ^ Kupferschmidt, K. (2013). "A Lethal Dose of RNA". Science 341 (6147): 732–3. ^ Cole Rosemary A (1976). "Isothiocyanates, nitriles and thiocyanates as products of autolysis of glucosinolates in Cruciferae". Phytochemutry 15: 759–762. ^ Trapp, S.; Croteau, R. (2001). "Defensive Biosynthesis of Resin in Conifers". Annual Review of Plant Physiology and Plant Molecular Biology 52 (1): 689–724. ^ Metcalf, Robert L. (2002). "Ullmann's Encyclopedia of Industrial Chemistry". Ullmann’s Encyclopedia of Industrial Chemistry (Wiley-VCH). ^ a b Wells M (March 11, 2007). "Vanishing bees threaten US crops". www.bbc.co.uk (BBC News). Retrieved 19 September 2007. ^ Colin, M. E.; Bonmatin, J. M.; Moineau, I.; et al. (2004). "A method to quantify and analyze the foraging activity of honey bees: Relevance to the sublethal effects induced by systemic insecticides". Archives of Environmental Contamination and Toxicology 47 (3): 387–395. ^ Oldroyd, B.P. (2007). "What's Killing American Honey Bees?". PLoS Biology 5 (6): e168.